Trailhead and parking area are on Iron Mountain Road in Jackson, NH (summit is in Bartlett). To get there, take Green Hill Road from the west side of Rt. 16, in between the two junctions with the loop Rt. 16A. Drive about one mile down this road bearing left through a small neighborhood to where the road narrows and turns to dirt. In 0.2 miles, bear left to stay on the road where another forest road takes a right. Continue 1.2 miles up this road, which becomes steep and winding. The parking area is on the right, just before the field and trailhead sign. There are three long ridges that extend off the southern side of Mt. Washington. The huge and rugged Southern Presidentials runs over the summits of four 4000-footers and boasting spectacular trails and ultra-popular hikes with magnificent views. The Montalban Ridge is wild and exciting; with its 4000-footer Mt. Isolation and other spectacular peaks like Stairs, Resolution, and Parker, there are plenty of treasures to be found. But the Rocky Branch Ridge is not like the other two. After it forks off from Boott Spur, it descends over a series of trail-less, forested, unnamed bumps, rendering it unworthy of hiking. The one and only trail-accessible peak is located at the lower end, rising above Jackson to the west. This is Iron Mountain. A southern spur of the mountain is patterned with windswept ledges which provide dramatic views. Additional viewpoints are found on the way up. The first viewpoint is found right at the trailhead. The Iron Mountain Trail, short but fairly steep, begins at the base of a large, sloping field near a camp cabin at the end of Iron Mountain Road. Follow the trail up the left side of the field as the fine view rises behind you. Just before crossing a peninsula of forest extending into the field, look back to see the majestic Presidential and Carter Ranges. The trail sneaks through the forest band and passes through the field again before entering the forest again. It soon crosses an old logging cut, then begins to slowly ramp up the mountainside, first through birches, then becoming steep with eroded footing through pleasant open forest. It mostly attacks the mountain head-on for over half a mile, rising to 2500 feet, where it makes one switchback, leading to the best viewpoint on this side of the mountain, which takes in nearly the same landscape as the viewpoint at the top of the field, but now from a much higher perspective. From this small rocky outcrop (with a sizable dropoff), you have a better view into Pinkham Notch. To the left, you gaze out across the ridges of Mt. Washington mentioned before; the insignificant hills of Rocky Branch Ridge roll away ahead, the upper Montalban Ridge is seen prominently to its left, and a few peaks on the Southern Presidentials peek over. This exquisite vista of valleys and mountains should be properly savored before moving on. Beyond this viewpoint, the trail grade eases as it gains the summit ridge. It soon passes an uplifted ledge on the left, where there is a very minimal view blocked out by firs. It continues to gently wander up to the summit, reached at 0.3 miles from the viewpoint. Immediately preceding the summit, the trail stumbles through a passageway of broken rock. At the summit proper lies a toppled fire tower; nearby is a well-designed trail sign which points the way across the summit to the next viewpoint. Here, you must unfortunately descend 370 feet on the other side. The trail accomplishes this in the next 0.7 miles as it descends steeply through a dark forest, then moderates and continues slowly down through alternating sections of forest and ledges. After hitting bottom, it climbs a small hump and splits at an unmarked junction. Turn right, as the left fork leads to an abandoned iron mine (for which the mountain is named) and drops an additional 250 feet. The main trail becomes slightly hard to follow as it leads across the extensive ledges. The scenery on the ledges themselves is quite nice in addition to the spectacular view. From the edge of the ledges, you have a sweeping vista looking south. 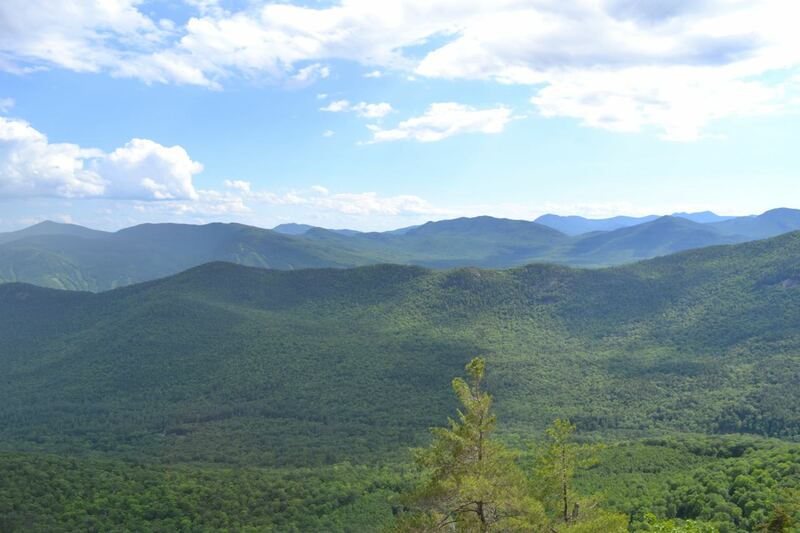 To the east, the ledge looks over the Conway valley, guarded by Kearsarge North. Opposing ski areas face off on opposite sides of the valley: Cranmore of the Green Hills is on the east side, while Attitash appears larger than life beneath giant North Moat and Big Attitash Mountains. The Moat Range stretches across the view, all seen above the small peaks of the lower Montalban Ridge, which curls around directly in front of you. The high peaks of the Sandwich Range, including Chocorua, can be seen behind the Moat Range. Off to the southwest, Mt. Carrigain is a dominant feature in the distance.